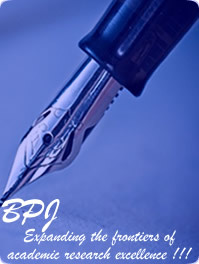 BluePen Journals is a leading international publisher of online specialized articles for researchers, research scholars, academicians, industrialists, consultants, prospective scientists, readers and students. Our coverage of virtually every field of study allows you to deliver your message to the audience of your choice, however targeted or wide-reaching. Take advantage of our full spectrum of online display advertising and sponsorships; designed to meet your budget goals and marketing objectives. Please contact our advertising sales representative for information about our online advertisements, by sending us an e-mail today to: service@bluepenjournals.org.